Ethics and Activism. Human Rights Activism. Anti Islam, Freedom of Speech, Freedom of Thought, Freedom of Religion. Why this topic? We start with ethics, with caring, with a sense of right and wrong, good and bad. We somehow become concerned about Islam. But what do we do? A few people instantly become activists, the moment they feel something is wrong. Far more of us are confused, uncertain, hesitant. We don't know what to do, what might work. We aren't sure what is real. What we're learning doesn't go with the mainstream message about Islam. Or we try things, but see that we're not getting our message through to people. Or we wish we knew how to do more. Finding effective strategies - not easy. 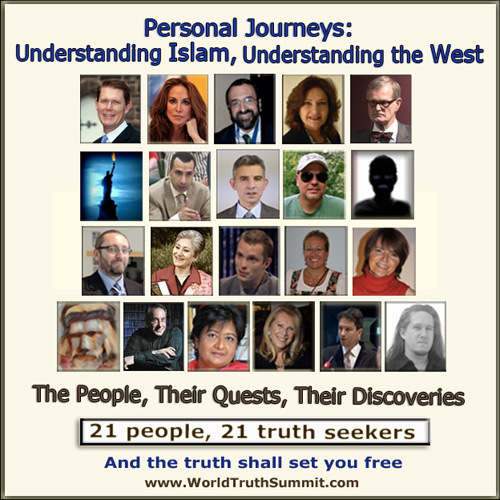 Each of the people interviewed has found their own way of being active about what is happening with Islam throughout the world. They have figured out effective ways of reaching people. Who's been interviewed? There is a mix of well-known people and others who are "local heroes" - people who have found ways of reaching others, but in a smaller way. For instance . 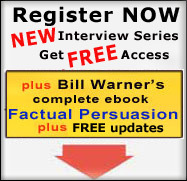 . .
Bill Warner, of PoliticalIslam. He created the term, political Islam. He created an easy-to-understand Koran. He has dedicated his life, since 9/11, to countering the threat of militant Islam. 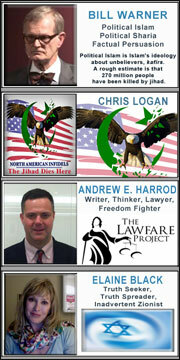 Chris Logan, of Logan's Warning and North American Infidel. 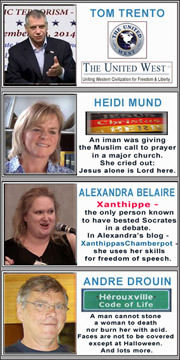 An online voice against the Islamization of the West. Andrew Harrod. He can't stop writing articles on Islam. You find them in almost every counter-jihad publication. And a new article is always forming within him. Plus he is a fellow at The Lawfare Project - countering Islamic lawfare. Elaine Black, passionate, intense, urgently needing to get out accurate information on what is happening with Israel, to counter the massive media distortions and outright lies which support terrorist organizations like Hamas. 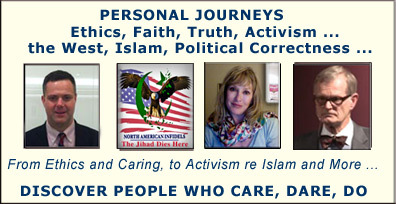 Robert Spencer, of JihadWatch, which has a worldwide reach. On top of that, he's published 13 books, including 2 New York Times bestsellers. His most recent book: Arab Winter Comes to America: The Truth About the War We’re In. 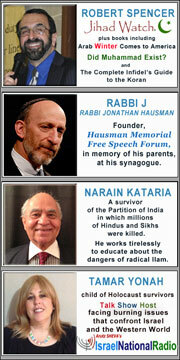 Rabbi Jonathan Hausman, of the Hausman Memorial Speakers Series. He's put his job on the line, by hosting, at the synagogue where he's the rabbi, a speaker series that includes Robert Spencer, Allen West … and even Geert Wilders of Fitna fame. Narain Kataria, who as a teenager experienced the partition of India. Over 1,000,000 Hindu and Sikh deaths. Now he educates - through the Indian American Intellectuals Forum, and the Human Rights Coalition against Radical Islam - about the menace of terrorism all over the world. Most of his activism has taken place after retirement - quite a common occurrence. Tamar Yonah, child of Holocaust survivors, is program director and Israel's most popular English-language talk show host at Israel National Radio. She faces the burning issues that confront Israel and the Western World - including the massive media bias against Israel. - and Elisabeth Sabiditsch-Wolff, who started by giving workshops in Vienna on the content of Islam, and soon faced criminal charges. 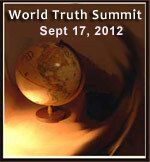 The truth was labelled "hate speech". Why should their stories matter to us? In many ways, their stories are ours. Two heads are better than one, it's said. Here are lots of people. Together we have a better chance of getting things to change. Freedom of Thought, Freedom of Religion. 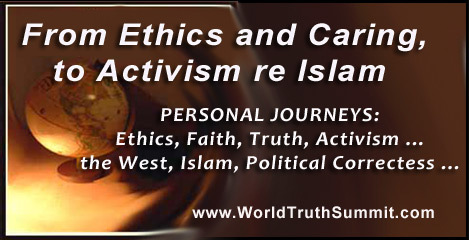 Ethics and Activism. Human Rights Activism. 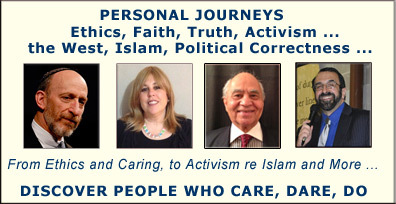 to the truth about Islam, click here.